Keating Chambers has an outstanding reputation professional negligence work. 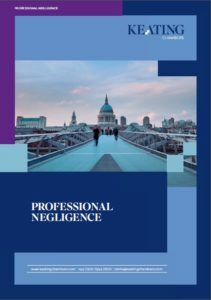 Our members have unparalleled experience and expertise in a range of technology and construction-related professional negligence cases, acting both for and against professionals in domestic and international disputes. We specialise in bringing and defending claims against professionals across the whole spectrum of construction and property related professional liability work, involving architects, contractors, engineers, government departments, indemnity insurers, IT consultants, project managers, property developers, solicitors and surveyors. Members also advise and represent parties in construction related insurance coverage disputes arising out of liability, material damage, consequential loss, project, CAR and professional indemnity policies. Our barristers are highly regarded for their advocacy skills and appear in very high-value, complex multi-party claims, mainly in the TCC. Many of these cases have an international element and members also have professional negligence experience in arbitration, adjudication and mediation. The depth and breadth of our expertise in this field is recognised in the directories, and we are ranked as a Band 1 set in the latest Chambers UK Bar Guide.